Honor those who have battled or is battling Cancer when you and your whole family wear and show support with our Cancer Awareness Sweatshirt. 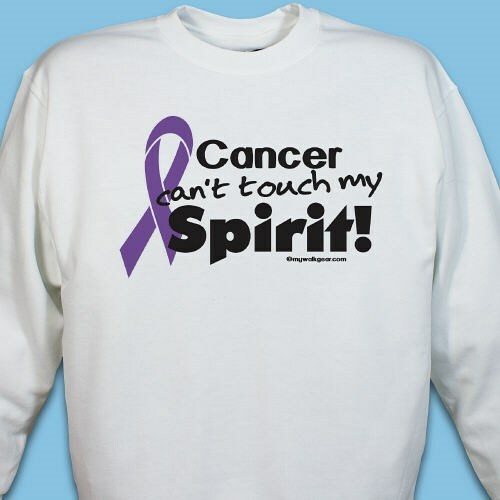 Our Purple Ribbon Cancer Sweatshirt is ideal for any cancer survivor, warrior and advocate because cancer awareness matters. Our Cancer Hope Ribbon Sweatshirt is available on our premium, 50/50 cotton/poly sweatshirt, machine washable in youth sizes XS-L and adult sizes S-3XL. Additional Info Wear Cancer Awareness Apparel and Gear to show your support. Each Awareness Shirt or Gift is great for events or any time to support awareness of cancer. Be sure to also promote awareness with our Purple Hope Ribbon Long Sleeve Shirt and our Purple Hope Ribbon Hooded Sweatshirt.